When your developer is ready to start working with our Freightview API — or you want to use one of our plug-ins for WooCommerce, Salesforce, etc. — you'll need to retrieve the API key for your account. 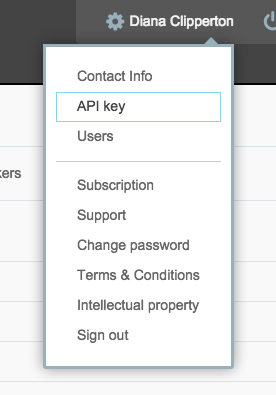 When you're logged into Freightview, click on your name in the top right corner and then choose API key. The panel that slides out has your API key and a link to the documentation. Be sure you keep your API key secret like a password. If you have any questions or want to brainstorm about your idea for using the API, we'd love to talk. Just send us an email at api@freightview.com.